Mid State Orthopaedic and Sports Medicine Center is hard to miss. The practice's new 30,000-square-foot building is marked with an enormous sign along one of the main roads in Alexandria, a central Louisiana city of about 48,000 people. In the elegant, high-ceilinged interior, the medical practice's 11 doctors see about 300 patients daily to bring in $10 million in revenue each year. It's a highly successful operation. But when practice administrator Spencer Michael started here two years ago, the business was struggling with a common problem: collecting payments from patients. The recent economic downturn and the increasing use of high-deductible insurance plans "has driven patients to want to put off paying their bills," Michael explains. Whether it's for a hip replacement or a broken bone, he frequently sees patients on the hook for a $3,000 to $5,000 deductible. "We have to be able to be the creditor," says Michael. "We're essentially a bank at that point." Between 2008 and 2012, multispecialty practices saw their bad debt go up 14 percent, according to a survey by the Medical Group Management Association, a trade organization for doctor practices. That's money that practices were owed but couldn't collect. Some of them have begun to change their billing strategies to combat those debts, says Ken Hertz, a principal consultant with the MGMA Health Care Consulting Group. "In the past, someone at the front desk would say, 'Would you like to pay today?' Because the simple answer to that is 'Well, no! If I can walk out without paying, I'm walking out without paying!' " Hertz says. "Today, it's more of, 'Mr. Smith, you have an outstanding balance. How would you like to pay for that?' "
One option for the doctors is to send patients who don't pay their bills to collection agencies faster. In the past, doctors tended to wait a full 180 days before taking action. But that could mean that patients who were well past the treatments didn't feel the import of settling the debt, according to Hertz. "That's six months. I'm feeling a lot better. Six months? Beat me up, try to collect from me," says Hertz. He is encouraging practices to send patients to collections after six to eight weeks instead. Another option is to collect the payments before a procedure even happens — an approach that Hertz says has proved particularly effective at Mid State Orthopaedic. 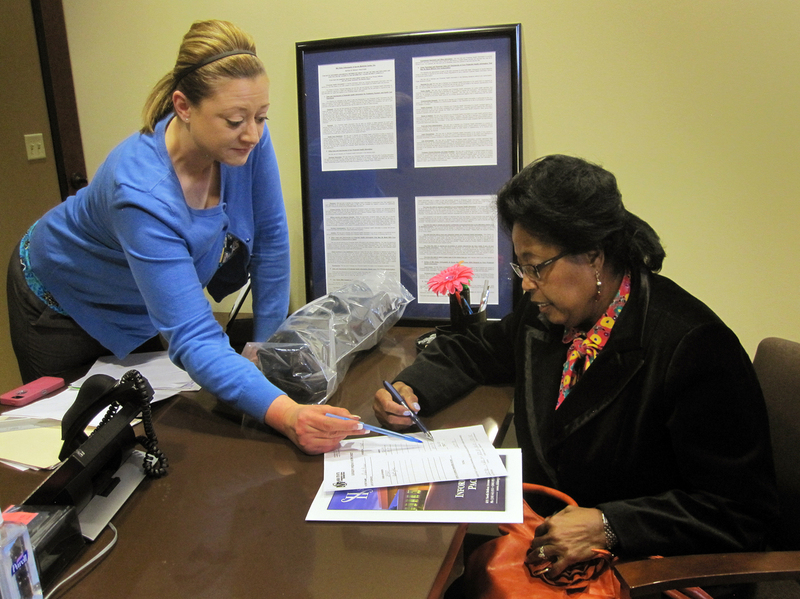 Bridgeit Vaughn (left), of the billing office at Mid State Orthopaedic, meets with Gayle Jackson-Pryce to discuss the costs of Jackson-Pryce's upcoming shoulder surgery. On a recent morning, Gayle Jackson-Pryce, 63, who pays her bills on time, stopped by the practice as a patient — to have her shoulder checked. "I was on a business trip and I picked up my luggage and immediately thought, 'Ooh, did I tear something?' " she recalls. Dr. Michael Leddy tells her she needs surgery on her shoulder. As she leaves the exam room, she passes the billing desk, where she pays her $50 copay for the office visit. Then, as she heads out of the building, she passes a second payment desk, where Deanna Tharp sits — one of two employees at Mid State Orthopaedic whose sole job is to collect payments from patients, often even before they have surgery. Tharp has an incentive to do it well; the more she collects, the bigger her bonus will be. Tharp starts with the practice's electronic record system. "This is the rotary cuff repair code, this is the price for it, this is Dr. Leddy's price," she explains to Jackson-Pryce. The system can access a patient's insurance details to find out exactly how much she'll owe. The total for the orthopedist's portion of Jackson-Pryce's surgery comes to $1,917.90. Once the insurance company's portion is deducted, Jackson-Pryce will owe the doctor a total of $831. Jackson-Pryce says she'll be able to pay the total amount upfront, although the practice recommended she wait a few days so they could double-check her deductible. For those who can't pay upfront, Tharp can help them set up a payment plan. Patients who still can't make it work are advised to seek treatment instead at the local safety-net hospital. Hospitals usually offer some sort of charity program to help low-income patients pay for care, but that's not the case for most private physicians' practices. The doctors at Mid State do offer some free care when they can, says practice administrator Michael, "but at the end of the day, this is still a business, and we do have to keep the lights on." Soon, patients will be offered an even faster payment option. In the waiting room, they'll be handed a tablet computer that's attached to a device that takes credit cards and be given the option to store their payment information for future bills. 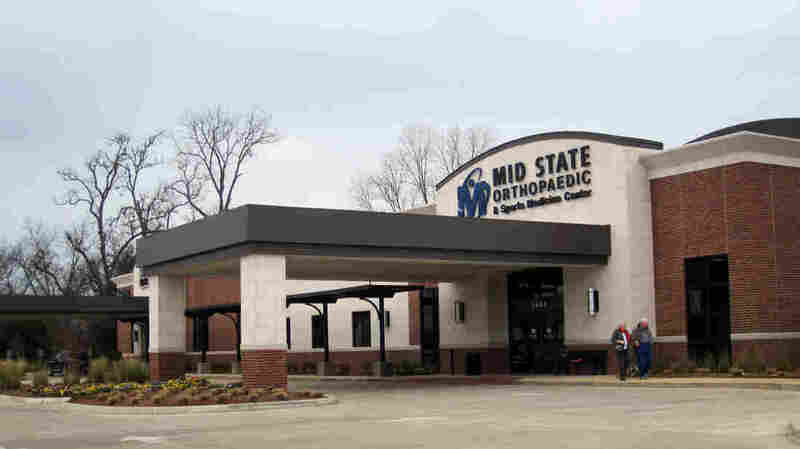 The upfront payment model is working well for the medical practice; bad debt at Mid State Orthopaedic has gone down by 25 percent over the past two years. But when patients hand over that kind of cash, Michael says, they expect to get what they paid for — like the fancy new building, which, he acknowledges, drives up the cost of care. "But that's the expectation of patients these days. And if we can't make that happen, they're going to go where they can get that," he says. Jackson-Pryce says it's the quality of the doctors she cares about, not the amenities. "I'm old, don't you know that? Old people don't get concerned about buildings. We figure we're paying for it. Oh, boy, I gotta pay more 'cause the building is nice!" she says with a laugh. After nine surgeries across the course of her life, she says she's used to paying a portion of her medical bills. So she always sets $1,000 aside for unexpected expenses. But, she says, that kind of money can cramp your style. "I never thought I would look forward to Medicare, but I do," she says. "Yes, I do."